My ideal SWAP wardrobe ? The rules for the Sewing With A Plan 2010 contest at Artisans Square are available. The idea is to make a wardrobe of co-ordinating pieces. I don’t do well under pressure so won’t be taking part, but I love making plans so I’ve already made several 😀 I admire people who make one plan and stick to it, but my mind just doesn’t work that way ! 4 bottoms – jeans, pants, shorts, skirts or kilts. This isn’t an ideal basis for my wardrobe, as I wear multiple layers. But this is just a fun plan anyway, so that doesn’t matter. When I let ideas spring to mind, I was surprised to realise my choices for tops are all Sewing Workshop patterns. Perhaps it’s not so surprising. They’re independent designers with a good selection of ‘pear shaped’ styles : flared sides with fitted shoulders. Rather than straight up and down styles with dropped shoulders, which are not flattering on me, and which most independent designers focus on. Despite that, my first choice is a modern ‘sloppy joe’, the Hudson top. I think this works because it’s oversized. Straight sided patterns look bad on me because I need 2 to 3 sizes too large on the top to get fit over my hips – not surprising they look awful. . . On an oversized top like the Hudson, the side seams are somewhere out by the wearer’s elbows, which has a different effect. I think this is modern because the armholes are high and the sleeves slim. Not like similar styles of 20 years ago which had such deep armholes they were like dolman sleeves – not flattering on me. In their latest newsletter (link below), Palmer-Pletsch recommend short tops with wide pants, or long tops with slim pants. So presumably they would prefer the shorter top with these pants. Personally I look better in longer tops and in slimmer pants, and would be unlikely to use this pant style. Spring Street : (oop) an attractive shirt with unusual collar. Though in the pattern the shoulders are more dropped and the sides less flared than they look in the line diagram. This is a rare case where the fashion drawing is closer to the style than the diagram is. Zigzag : has a front yoke. Perhaps it’s the recent version of the Spring Street shape, with changed collar and sleeves. Zona : has interesting seam and dart placements. It isn’t flared, so I would add some, probably at the underam. Another pattern which meets my criteria is the Liberty shirt. And it has my favourite high collar. But I can’t include everything ! These tops would be good for me as they can also be worn as layering pieces – a way round the SWAP rules if you need warmth. Inspired by the What did you wear today ? strand at Stitchers Guild, I really do need fitted tops as they are more flattering for me. I think I might be willing to post a photo of myself wearing something fitted, though not wearing my usual shapeless RTW. But oh fitted garments do need so much trouble with fitting ! Still, I would like to have these 2 patterns as TNTs, so. . .
Tribeca : I love this style – reminds me of a blouse I happily wore to rags. Sad to say, I gave up on my first attempt to get all those darts to fit my small busted, short waisted, high hipped, sloping shouldered, forward necked self, but one day. . .
Salsa : another attractive style which would also need a lot of careful fitting on me. All these tops have raised necklines, which suit my longish neck. I just wear pants as neutral background for tops. The Zigzag and Mizono (below) patterns include slim pants, so if they work well they could be a good basis. As I’ve chosen tops which cover the waist, the unflattering effect of an elastic waist on me would not matter so much. Co-ordination : It isn’t necessary in the SWAP this year for all tops to go with all bottoms, but they are supposed make a ‘collection’. If the pants are all similar, that would ‘just’ be a matter of fabric choice. I’m cheating by not mentioning fabrics, as many people find this the most difficult part of making a co-ordinated wardrobe. This would have to be a layering piece, to give me some warmth. To meet the rules, I’m only allowed one jacket, but four come to mind. There are recent Koos Vogue 1146 or Mizono Vogue 1145 patterns. I love the snuggle look of the Mizono style, but it’s tapered at the sides, oh dear – well it’s big so perhaps it would be okay. I also love the scarfed swing coat style. There’s DKNY Vogue 1129, said to be Easy but actually needing fitting skills. 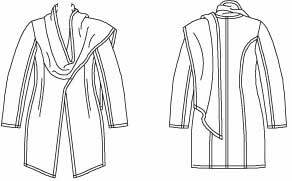 Ultimately I do need to do that fitting work, as I would like to wear a fitted coat instead of my big straight parkas. And fitted RTW just looks ridiculous on me. Or for a much easier scarf jacket there’s McCall’s 5987. Co-ordination – a layering piece has to work over all the outfits made from tops and bottoms. I don’t think the Koos jacket would work well with the necklines of the tops I’ve chosen, but the others would. I think the Mizono all enveloping jacket with big shawl collar would be a good choice from that point of view. If I make the most sensible choice, it’s the McCall’s scarf jacket. But if I choose by love, it’s the snuggley Mizono or eventually the DKNY fitted one ! There are some subsidiary rules for the SWAP this year, to test sewing skills. 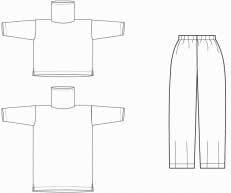 1 [garment] will be a matched print or stripe. 1 will feature embroidery, beads or sashiko. 1 will have buttons as the star feature OR use unusual or alternative closure(s). It would be fun to make the Zona top with matched chevron stripes ! Each piece would have to be cut individually – start from one of the fronts and work round. Use a pattern with seam allowances removed, as it’s essential to match sewing lines not cutting ones. But it would probably be impossible to end up with stripes matching at the front, so this isn’t really a good idea. . . It might work by shifting the front opening sideways so the stripes at the edge of the opening match the other side when the front is closed. And it would need the side seams changed to vertical. The obvious choice to embellish is the Koos jacket. It’s designed to add embroidery to. Or the yoke could be made with sashiko. But otherwise that pattern doesn’t fit well with this plan. The yoke of the Zigzag top would also be an easy place to add embroidery, beading, or sashiko. Or the seam and dart lines of the Zona top could be emphasised by added trim or embroidery. I could use the Diane Ericson Revisions Nuevo shirt View B, instead of one of the other tops. Those dots on the shirt front are actually small buttons. Can you get into it ? Does it look tight ? What size do you need a top ? I made a mock-up to test how big a pullover needs to be for me to get into it. Then I realised I could also find out how big a layering top needs to be so it doesn’t look strained. I made a mock-up from a couple of large non-stretch fabric rectangles. I gradually moved the side seams in until it was just too small, when the fabric looked a little strained and lumpy. Use your largest measurement to choose the width. If you need an FBA or have a large abdomen, cut the front piece 4 – 5 inches wider than the back. Align the side edges to sew the seams. Sew the initial seams as marked. Use contrasting thread. The largest I want a layering garment to be is over a thick sweater. So I started by trying my mock-up over that. I’m larger below the waist than above, and my hips are my largest part, so I started by checking fit over my hips. I basted the side seams further in, 1/4 inch or presser foot width at a time. Until the first time when the fabric was a little distorted at hip level. So I knew the previous size was the smallest I can wear a layering top over a thick sweater and look good. And I measured between those seams. Then I tried the mock-up over a thin layering top, and moved the seams in again. Then I tried it over a loose shirt and camisole. So I knew about layering tops for my hips. Then I moved on to testing fit without strain at the underarm. For this, I just sewed short seams above the waist. Arrow points to size to measure for the underarm. If you’re larger above the waist, start by testing your underarm. Then you could check how much narrower you can go at hip level and still wriggle through it. over a loose shirt : at least 42 inches. Don’t use my numbers for yourself. I think people with different styles, shapes, and favourite fabrics will get different results. I used a medium muslin with a bit of body for my tests and I don’t wear close fitting clothes. You could also use this mock-up to try out different neck opening sizes. You’re making a pullover top. Using a pattern you’ve made from a blouse/shirt or jacket pattern by closing the opening, can you get into it ? – Don’t sew any waist darts. 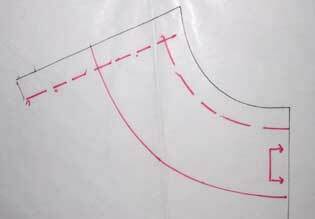 – Straighten out the side seam from bust to hip. Also check the neckline opening is bigger than your head. Then, if your bust is larger than your shoulders, you should have no problem getting the garment on. If, like me, your shoulders are bigger than your bust, you need to check this. With a knit fabric this may not be a problem, With a woven fabric with no stretch, it may be. I found my results interesting. My shoulders at rest measure 41 inches, and my bust is 36 inches. So I assumed I would need something bigger than my bust to be able to get into it. I tried my mock-up over minimum clothes to find what is the smallest I can wriggle in to. I found I can get into something that is several inches smaller than my top : 32-1/2 inches. Not that I’d actually ever wear anything that measurement ! It was very uncomfortable, but certainly endurable for the short time of getting a garment on. I don’t know if there’s something odd about my shoulders, or if this is true for other people. But at least for me, getting something over my shoulders is less of a problem than I thought it would be. It looks as if I don’t need to remove all the waist shaping in a pullover pattern just so I can get it on. How do you compare your findings with the pattern ? 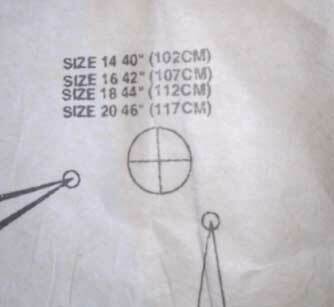 The finished garment measurement is usually printed on the pattern, somewhere near the bust and hip points. Or it may be in a table near the beginning of the instructions. 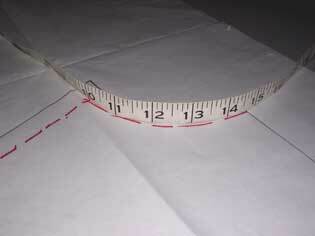 If it’s not supplied, measure the pattern (allow for seam allowances). 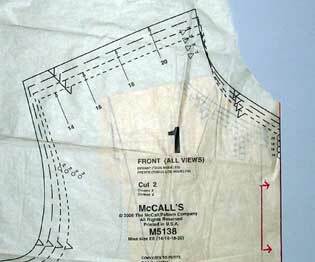 On the McCall’s 5664 pattern I based my pattern alterations on, the finished garment in my size is 43-1/2 inches at underarm. For a layering top over a loose shirt I need 42 inches. Over a thin sweater I need 44 inches. So I could wear this top over a loose shirt, but it might not look good over a thin sweater. If I wanted a top to wear for that, it could be best to alter this pattern a little. The Nancy Zieman oop McCall’s 5526 jacket (left below) has 40 inches at underarm. Obviously designed to be worn over something light, a camisole or perhaps a fitted blouse. The Marcy Tilton Vogue 8454 jacket (right) has 45-1/2 inches at underarm. So I could easily wear that over a thin sweater, possibly over something thicker. If you want a layering item to wear over a thick sweater or a big jacket, also measure your biceps. Check the pattern sleeve width is at least a couple of inches larger. I’m surprised how much I’m using this information. It makes it easy to check I can use a pattern for what I want without changing the size. I’ve also used this to buy mail order from companies that say what the actual measurements of their garments are. What to do if your pattern is too small ? 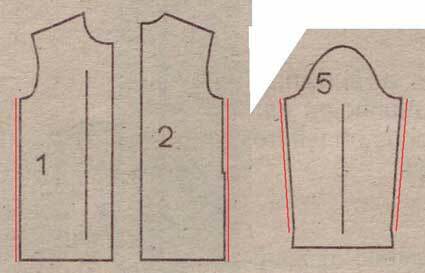 If you need 1 inch (2.5 cm) larger, add 1/4 inch / 6 mm to the pattern at side and sleeve seams, as in the diagram. If you need 2 inches (5 cm) larger, add 1/2 in. / 13 mm at each of the marked places. If you need more than 2 in. (5 cm) added at the underarm, sorry this size is not a good starting point for you to make a pullover or layering top with minimal changes. If you go up a size, you don’t only increase the underarm. You also lower the neckline, lengthen the shoulder seam, and enlarge the armhole. These are usually good for a layering top anyway. But it’s worth checking if the changes are flattering on you. Or start from a pattern that is more loose fitting. You don’t need to know about ‘fitting ease’ to assess patterns for layering, but it’s related. And it’s useful to know when buying patterns. 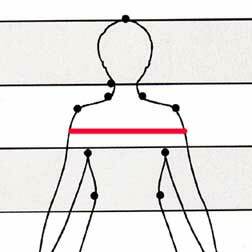 The difference between actual garment measurement and body measurement is called the ‘ease’. 40 – 36 = 4 inches. Here is a general post on ease levels. The finished underarm measurement of a pattern isn’t usually given on the envelope. So you have to use the fit description when choosing a pattern. For example, for a garment to wear over a thin sweater, I like at least 44 inches at underarm. So I need 44 – 36 = 8 inches of ease. The table tells me I can get this from a top pattern described as very loose fitting, or a larger jacket described as loose fitting, without having to make underarm changes. While you’re experimenting, why not try out lengths as well. 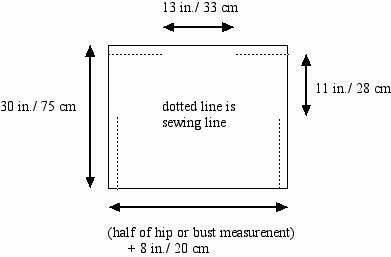 To make a fashionable thigh length top, most people need to add about 10 in./ 25 cm to a low hip length pattern, and add about 20 in./ 50 cm to a high hip length one. Some people look better with a long top at mid thigh. Others look better with a top an inch or so above the knee. If you look good in several widths of pant leg, you may find you look best in different lengths of top, depending on how tight your pants are. Robin has some good posts on body length proportions. Detailed written instructions are in Fit For Real People pp. 62-73 or Looking Good pp. 31-33 ,(Palmer-Pletsch books). Robin has the good idea of using a square to make the marks – much easier to do it without help. You don’t need a drawing instrument square. Any firm corner will do – a piece of cardboard, even a full pattern envelope ! Getting this information is like making a fitting sloper, but a lot less work. When you’ve done this once, you know your head size (previous post), the size you can get your shoulders through, and the sizes you need for layering items. Then changing a pattern from open to closed can be relatively simple. Patterns and links available November 2009. Comments: Comments Off on Can you get into it ? Does it look tight ? Changing from an open fronted design to a closed one looks as if it would be easy – just remove the button band. But there are some important things to check ! – can you get your head through the neck opening ? – see below. Mark the centre front line (not the edge fold line) on the pattern (it should be printed on). Trace the pattern to this line. Fold the pattern on the line. Though actually it’s essential to check the neck opening and underarm ease before cutting out. Can you get your head through the resulting neckline neck opening ? Measure your head. This is not your hat size, but your head measured loosely over hair, ears and nose. This is the size your neck opening needs to be for you to get it over your head. If you want to protect your hair-do or make-up, add an inch or two more. On the front and back pattern pieces, draw in the neckline and shoulder seam stitching lines. This is easy to do with a French Curve which has 5/8″ (1.5 cm) marked along the curved edge. 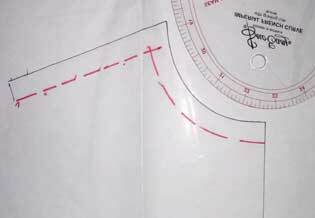 Measure the stitching line on the front and back patterns. Use the edge of a tape measure. Remember not to measure across seam allowances. is the length of the neckline opening. Compare this with your head size. My head measures 25″ (long hair up back of big head). So, if I want to use my fitting sloper as the basis for a pullover pattern, I need to make the neck opening much larger ! If the pattern neckline is not big enough for you, there are many things you can do. To keep the same shape of neckline, lower the stitching line an 1/8″ (3 mm) at a time, until the opening is big enough. Or redraw the front neckline to a V or scoop neck, or widen the neckline at the shoulders to a boat neck. It’s easiest to change neckline shape if you retain the shoulder point (where neck line and shoulder seam stitching lines cross). Then you can alter the front without having to alter the back to match. Or add a neckline slit, front or back. Or a half-length closable opening, such as an exposed zip or henley/polo button placket. Or transfer the neckline from another pattern. I’ve taken several classes with Shannon Gifford at Pattern Review. So I’ve learned to trace my patterns. If you’re doing that anyway, making small pattern changes takes little extra effort. Whatever neckline finishing treatment you use, make sure to lengthen it to match the new neckline. It’s easy to make your own facing patterns. 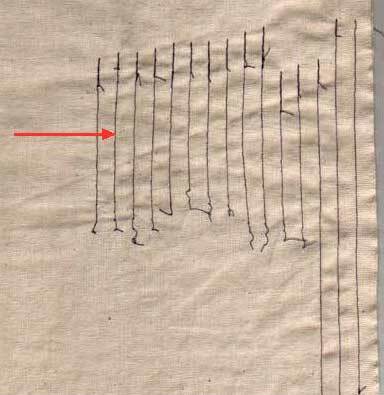 Draw a line 2-3″ (5-7.5 cm) from the stitching line. That is the outer edge cutting line of your facing pattern. If narrow facings flip out for you, use the 3″ / 7.5 cm width. For me, this happens with wider necklines. If the pattern has a collar, you’ll have to alter that to match the new neckline. 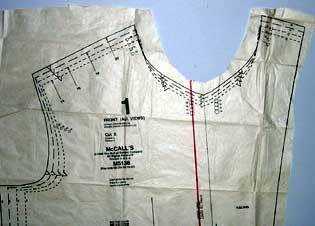 On the body pattern pieces, measure the neck stitching line from Centre Back to collar attachment point on the front. 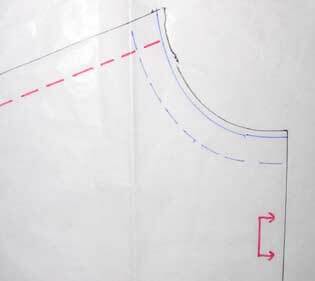 On the (half) collar pattern, measure the neckline stitching line. This is the amount you need to change your collar (you measured half the body pattern, so it’s the amount to change half the collar pattern). On a straight collar, alter at centre back. 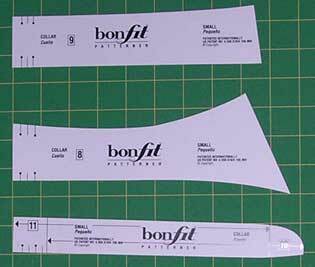 These collar templates have a choice of lengths marked at centre back. 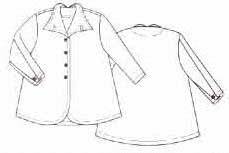 With a curved collar, mark the position of the shoulder seam. Then slash and spread, or slide, by the amount needed. 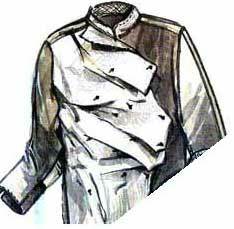 You probably need to spread more at the outer edge of a curved collar, so it will lie in the same way as the original. If you want to test your new collar pattern before cutting fabric, cut it out in kitchen roll paper. This has much the same firmness as interfaced fabric, and sticks to clothing without needing to pin it in place. – can you get it on over your shoulders/bust ? I’ve got so much to say on that, I made it a separate post. – is there enough ease at bust or hip level to be comfortable ? That’s also covered in that post. And here’s a post on ease in general.